“All terrorism is theater. All counter-terrorism is theater.” So spoke Dr. Anne-Azza Aly, a counter terrorism expert at Curtin University in Perth, Australia, Monday night on the Australian Broadcasting Corporation’s Q&A (known as “qanda”), where panelists answer audience questions about issues of the day. Her co-panelists, among them members of the serving government and Opposition, mostly disagreed. Terrorism, argued one, is real because it kills people. The 4 a.m. raids across Sydney and Brisbane that left 15 men arrested but only one kept on terrorism charges were real, also. He may have misunderstood Aly’s point. “Security theater” is a well-worn term in security studies and never more than over this past 13 years. The headlines in Australia have been full of terror threats and anti-terrorism laws and debate these past few weeks. On Tuesday in Melbourne, 18-year-old Numan Haider, now referred to as a “known terror suspect,” was shot dead by police when he attacked two officers with a knife, seriously wounding one, after being called in for an interview to a police station. Victorian police commissioner Ken Lay told reporters that Haider’s passport had been cancelled several months earlier. The young man had apparently begun to hold more extreme views in recent months and ended up becoming a person of interest to police, who had also been watching the mosque he used to attend, Al-Furquan. There was little theater in his death or the wounding of the two officers, but it has come after much “chatter” on the subject these past few weeks, in a nation that is usually a step removed from terrorism worries. Last week, 800 police officers raided 25 locations across Sydney and Brisbane, arresting 15 men and eventually charging one. The “theater” element may be up for debate (at least as long as it remains misconstrued), but given the media was told of the event via police Tweeting and given that video footage was provided, it seems to have at least been thoughtfully stage managed. Many have questioned the timing, given recent troop commitments of 600 to provide humanitarian support against ISIS. Those who do raise questions are sometimes attacked for it (accused of not being part of “Team Australia”). Heavy-handedness may play into extremist hands, suggested one terror expert, yet not doing enough or allowing someone to escape will only leave the force open to criticism. At the same time, security levels at Parliament House in Canberra were increased after Prime Minister Tony Abbott said “chatter” had been intercepted discussing acts against individual politicians. Prior to that, the threat level in Australia was upped by security agency ASIO from medium to high (but not extreme). High means a terrorist act is likely; if it’s extreme it’s imminent. ASIO head David Irvine had weeks earlier told a conference that the agency was currently overloaded and that the number of Australians travelling to or, worse, returning from Syria was a problem. 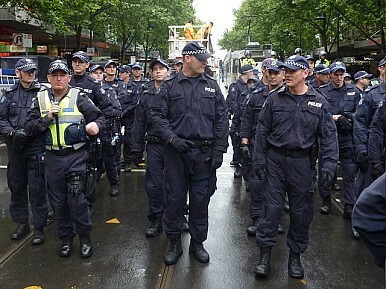 Security will be much tighter at the Australian Football League’s (AFL) Grand Final in Melbourne this Saturday also. New anti-terrorism legislation to pass through parliament this week will also give police more powers to arrest and detain suspects (and suspects they are since reasonable proof is not needed, mere suspicion is enough) without a warrant. Passports can now be more easily suspended and individuals not officially charged may still be restricted in their movements or forced to wear electronic tags. There will also be restrictions on travel to certain areas, outside of areas such as humanitarian work. Politicians have promised these measures will not affect the general public and Justice Minister Michael Keenan has pledged many safeguards. Many in Australia’s large Muslim community are concerned these laws will target them unfairly. The Islamic community has already held protests about the terrorism raids. The government decries any Islamaphobia on its part, though Senator Jackie Lambie of the minority Palmer United Party (PUP) wants to ban the burqua, as does Coalition member Cory Bernardi (though neither is taken especially seriously, even within their own party). Talk about terror, and the recent raids, has been more carefully managed than earlier attempts to convince Australians of the usefulness of any law purportedly designed to protect them. Some weeks ago, both Tony Abbott and Attorney General George Brandis famously stumbled through explanations of how and why the government would demand the retention by Internet service providers of citizens’ metadata for two years as part of the new laws and an AUD630 million ($558 million) boost to anti-terror spending. It would have helped had they been able to make clear what they thought “metadata” might have been to begin with.